Egg Protein Diet Plan for Weight Loss – Good or Bad? Egg diet plan is an easy way to lose your weight within a short span of time. This is an excellent diet plan for those who want to lose weight but cannot go without eggs even for a day. Dieting normally means eating lots of vegetables and fruits, but eggs are also an excellent means to lose weight. They help in burning the calories that are present in the body and help in losing weight. This diet plan is inexpensive and efficient. Moreover, you need not exercise when you follow this diet plan. In this diet you are to have eggs and grape fruit for every meal. Having limited quantities of chicken, steak and meat are also allowed. Consuming vegetables is strictly controlled. This is an extreme form of egg diet plan, wherein you are to eat only hard boiled eggs and lots of boiled water. People are advised not to follow this diet plan as it is more harmful to your body than beneficial. By taking only eggs, your body will start getting weaker due to the lack of proper nutrition. Traditional egg diet avoids exteremes and allows you to take two or more eggs with vegetables and fruits that are low in carbohydrates for breakfast. Lunch may include eggs with fish or chicken. For dinner you may have some fish or steak with eggs. When you follow this diet you must avoid food items rich in carbohydrates like bread, pasta and potatoes. The amount of fruit you eat is also limited. None of the recipes given below make you use butter or oil as they add more fat to your body and spoils your diet plan. Put a non stick pan on a flame and make it hot. Crack an egg and pour it on the hot pan, and then lower the flame. Cook the egg on the pan till the yolks become thick but soft, and the white of the eggs is set. Now turn it over and cook the other side also. Season the egg thus made with salt and pepper. Have it hot with freshly made salads. To make this dish, take 6 eggs and put them in a pan with cold water. Put the pan on high flame and add a pinch of salt to the water. Lower the flame when the water starts boiling and cook for 10 minutes, covering the pan with a lid. Take the eggs out from the boiling water and tap the eggs gently, so that the shell cracks. Keep these eggs in a bowl for 60 seconds and then remove the shell from the eggs. Now the egg is ready to be eaten. Take a saucepan with water and place it on a medium or high flame. Let the water boil well. Now you can lower the flame and stop the boiling. Crack one egg at a time into the water to which vinegar is added. Now cover the pan and cook for about three minutes. After three minutes, take the eggs out carefully and place them on steamed spinach. Sprinkle spices and herbs on the eggs and have them. Take whites of two eggs and mix it with salt and pepper in a mixing bowl. Put a deep frying pan on medium or high flame and heat it. Sauté onion pieces on the pan till the pieces become crispy and then sprinkle water to prevent onion sticking to the pan. Now add zucchini and fry, followed by tomato and spinach. Cook till the tomatoes become pulpy. Add the egg mixture and cook till the eggs are set. You may have it with salads. Take vegetable that you prefer like carrots, spinach, tomatoes, zucchini, onions and so on. Take two eggs, add water, green chillies and salt, and mix till it becomes foamy. Add the cut pieces of vegetables and then pour it on a frying pan that is heated. Cook till the eggs are set and attains a golden color. Sprinkle Italian herb mix and serve hot. It decreases you r appetite and hence prevent eating of more food as it is rich in proteins and low in carbohydrates. You can speed up your weight loss by having eggs in the morning. Being rich in vitamins and proteins, consuming eggs is very healthy for your body. The high protein content in eggs induces burning of calories in the body, helping you lose weight. If you consume too much of eggs, you may suffer from constipation and bad breath. You must take care not to carry on egg diet for more than a week at a time. This is because you body does not receive all the essential nutrients that you get from vegetables and fruits. 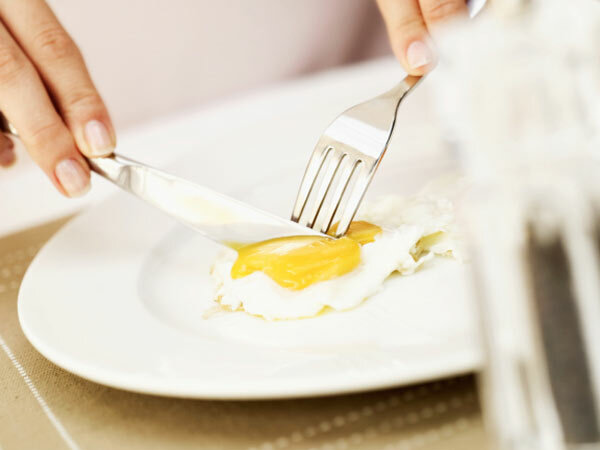 Another disadvantage of egg diet is that it makes you fed up with eating the same food for many days. Many of the people following egg diet tend to opt out of the diet plan much before the time schedule. Another disadvantage of egg diet plan is that once you stop the diet, you will get back all the weight that you have taken so much pain to lose during the diet plan. Eggs are rich in cholesterol and it is not yet proved whether consuming to much of eggs can increase blood cholesterol or not.